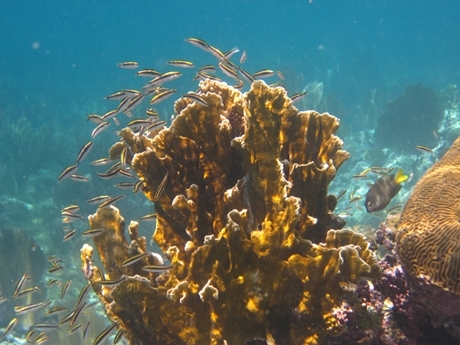 We’ve spent 2 ½ days here in Guanaja, visited the town, circled a good part of the island in our dinghy and snorkeled. The weather will be taking a turn for the worse in about 2 days so we are going to start heading back to Roatan tomorrow. 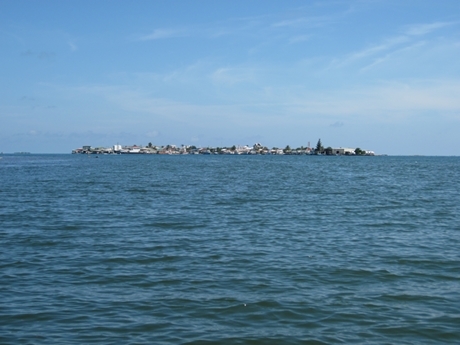 Guanaja is an interesting place as most of the residents live on a small island, called Bonacca, in the bay as opposed to the main part of the island. And up close up you can see how crowded it is. 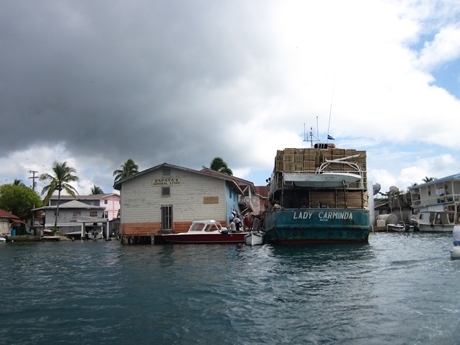 The building on the left is one of the main stores on the island, and there was a constant stream of boats like the Lady Carminda pulling in to that spot to off load cargo. All cargo was hand trucked to its destination as there are on motor vehicles on the island. Here’s one of the island sidewalks – some were a bit wider and some narrower. 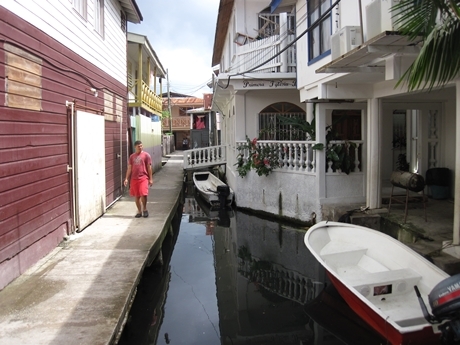 There is a series of canals through the island, but most are narrower then the sidewalks and the low bridges make getting through difficult. We didn’t even try. 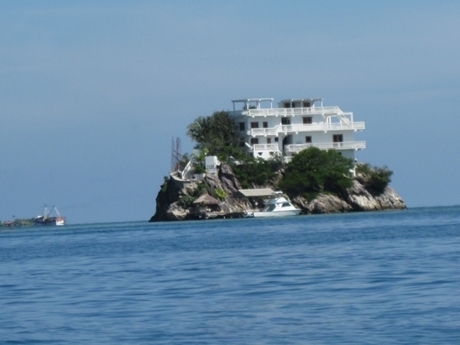 Of course those with a bit more money to spend can have an island all to themselves. There is a canal that cuts Guanaja in two and we took our dinghy and went through the canal to the other side of the island. Normally this is the windward side and very rough, but with the light winds we’ve been having we traveled about half way around the island before turning back. 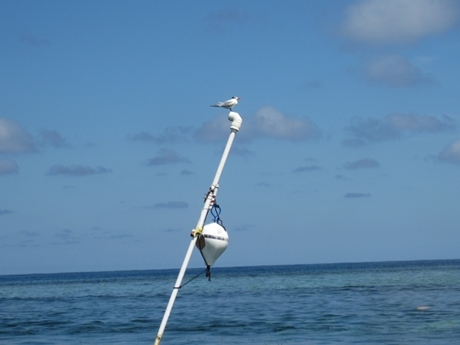 We turned around because fuel was becoming an issue and we didn’t know exactly how far it was to continue to circle the island, nor did we know if the reefs might pose a problem requiring us to slow down or back track to get through. As we exited the canal on the windward side we spotted this lighthouse. 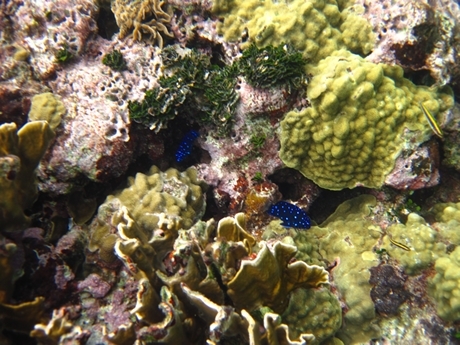 I don’t know what kind of fish these blue ones were in the next picture, but the spots almost twinkled. Tomorrow we’re off to Isla Barbareta. 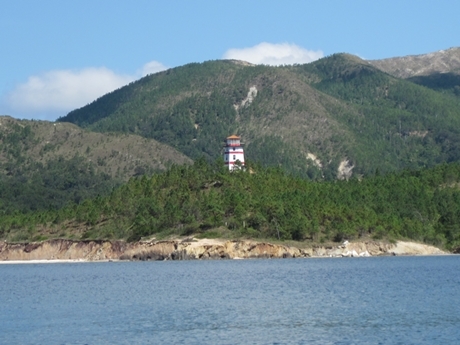 It’s and island at the East end of Roatan, that some consider part of Roatan and others don’t.